If you want to make the most of good nutrition for better health, the answer is simple: eat plenty of nutrient-rich foods, like fruits, vegetables, lean protein, low-fat dairy products, beans, nuts, seeds, and whole grains, and be moderate with foods that contain fat, sugar, and calories. Here are top food sources of some essential vitamins and minerals. Rise and dine on a cup of fresh cantaloupe (213 µg) in the morning. Pour a cup of milk (149 µg) on your breakfast cereal. Add baby carrots (517 µg) to your lunch salad or munch on carrot sticks with your sandwich. A sweet potato (958 µg) is a sweet treat at dinner. A banana (.66 mg) a day can help keep the doctor away. Stack individual serving cans of veggie juice (.24 mg) at your desk for a midday vitamin boost. A ground turkey burger (.32 mg) and a baked sweet potato (.27 mg) with dinner, along with watermelon (.23 mg) for a sweet dessert, can help round out a healthy meal. Pour a cup of skim milk (0.9 µg) on top of fortified (1.5 µg-6 µg) cereal for breakfast. Enjoy a turkey sandwich (1.7 µg) at lunch. Baked flounder (2.1 µg) is a super lean way to help meet your vitamin B-12 needs. A glass of orange juice (97 mg) will meet your daily need before you leave the house in the morning. Add peppers (45 mg) to your lunchtime salad. Pour 8 ounces of milk (2.5 µg) on top of a serving of raisin bran cereal (60 IU) to start your day. An egg substitute (0.6 µg) omelet is a delicious hot lunch or fast dinner. Mix a cup of milk (2.5 µg) instead of water into your evening mug of instant cocoa. Pour 8 ounces of milk (2.5 µg) on top of a serving of cold cereal (60 IU) to start your day. Cereal (100-400 µg per serving) is an easy way to jump start your morning. Have a cup of orange juice (109 µg) with your sandwich (40 µg for 2 slices of bread) at lunch. Enjoy two cups of pasta (120 µg) and asparagus (131 µg) at dinner. Smear a tablespoon of peanut butter (2 mg) on two slices of toast (2.2 mg) for breakfast. Add tuna (4.9 mg) to your pasta (2.3 mg) salad at lunch. A top round steak ( 3.3 mg) along with a baked potato (3.5 mg) and tons of vegetables make for a tasty dinner. Pour a cup of milk (300 mg) on your cereal or drink a cup of calcium-fortified juice (300-400 mg) at breakfast. Sprinkle parmesan cheese (138 mg) on your salad or add low fat cheese (200 mg) to your sandwich at lunch. Have a carton of yogurt (300-450 mg) along with a tall decaf latte made with skim milk (200 mg) in the afternoon. A bowl of shredded wheat (65 µg) with milk and fruit is an easy way to start the day. Slip an ounce of American cheese (48 µg) into your noon-time sandwich. A cup of peas (60 µg) will give your dinner some chromium power. A cup of raisin bran cereal (6 mg) with milk and fruit is a great snack. A turkey (0.9 mg) sandwich on whole wheat bread (1.8 mg) is a fast, on-the-go lunch. Add a side salad with chickpeas (1.6 mg) and a handful of raisins (1 mg) as a snack. Enjoy a shrimp (2.6 mg) and pasta (2 mg) night for dinner. Rise and dine with a glass of grapefruit juice (405 mg), followed by fresh strawberries (247 mg) topped with yogurt (498 mg). A trip to the lunchtime salad bar can be a potassium heaven. Start with two cups of spinach (624 mg) and then ladle on chickpeas (207 mg), broccoli (228 mg) and tons of other veggies. A baked potato (903 mg) stuffed with low fat cheese and broccoli (456 mg) will allow you to hit the potassium jackpot. Don’t forget to chase it with a glass of milk (406 mg). Start your morning off with wheat germ (23 µg) mixed into your cereal or yogurt. A tuna (69 µg) salad on whole wheat bread (20 µg) is a quick way to meet your selenium needs. Try a dinner of baked chicken breast (22 µg) along with veggies and rice. Try a breakfast yogurt parfait of fresh fruit, yogurt (2.2 mg), and bran flakes cereal (1.2 mg). Getting tired of tuna? Try opening a can of crab meat (6.5 mg) and mix it with light mayo for a yummy pita pocket lunch. Don’t forget the tossed salad with some sunflower seed kernels (1.5 mg) tossed in for crunch. Bake turkey thighs or legs (3.8 mg) along with a potato and serve with steamed spinach (0.7 mg) for a dinner. Many people who have headaches may be low in Vitamin D, riboflavin, magnesium or coenzyme Q-10. Talk to a registered dietitian or physician to see if testing and/or supplementation may be for you. Serve leftovers on top of a bed of greens, cover, put in the microwave and reheat! 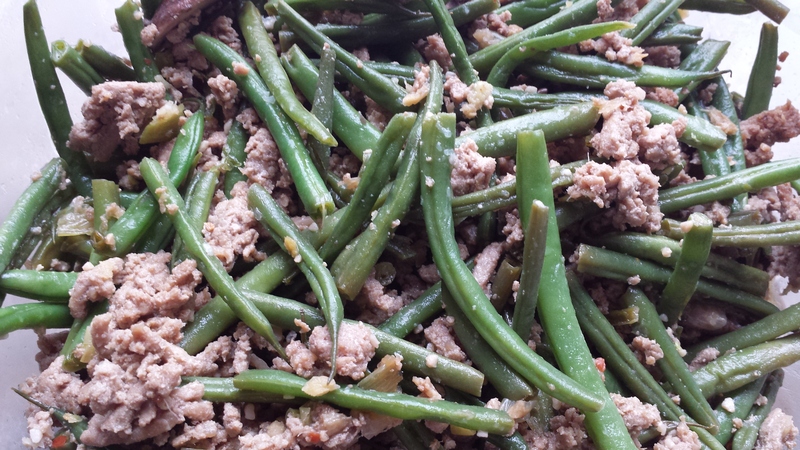 Green Beans – Nutrient Rich, Calorie Smart! Green beans are low in calories and loaded with nutrients. They are particularly good source of Vitamin K. One cup has 122% of the Daily RDA! Vitamin K is important for maintaining strong bones and to coagulate the blood. Fresh green beans are very low in calories (31 kcal per 100 g of raw beans) and contain no saturated fat; but are very good source of vitamins, minerals and plant derived micro-nutrients. Here is how to roast green beans for a delicious side. They are very rich source of dietary fiber (9% per 100g RDA) which acts as bulk laxative that helps to protect the mucous membrane of the colon by decreasing its exposure time to toxic substances as well as by binding to cancer causing chemicals in the colon. Dietary fiber has also been shown to reduce blood cholesterol levels by decreasing re-absorption of cholesterol binding bile acids in the colon. Green beans contain excellent levels of vitamin A, and many health promoting flavonoid polyphenolic antioxidants such as lutein, zeaxanthin and beta carotene in good amounts. These compounds help act as protective scavengers against oxygen-derived free radicals and reactive oxygen species (ROS) that play a role in aging and various disease process. Zeaxanthin, an important dietary carotenoid in the beans, is absorbed into the retinal macula lutea in the eyes where it thought to provide antioxidant and protective light-filtering functions. Therefore, it is helpful in preventing age related macular disease of the eyes in old age. Fresh beans are good source of folates. Folate in the diet during preconception periods and during pregnancy helps prevent neural-tube defects in offspring. Green beans also contain good amounts of vitamin-B6 (pyridoxine), thiamin (vitamin B-1), and vitamin-C. Consumption of foods rich in vitamin C helps the body develop resistance against infectious agents and destroy harmful oxygen free radicals. They also contain good amounts of minerals like iron, calcium, magnesium, manganese and potassium which are very essential for body metabolism. Manganese is a co-factor for the enzyme superoxide dismutase, which is a very powerful free radical scavenger. Potassium is important component of cell and body fluids that helps controlling heart rate and blood pressure. Serve this dish with steamed brown rice. Why choose brown over white rice? Researchers tracked 200,000 people for 22 years. Those who ate 5 servings of white rice per week had a 17% higher risk of Type 2 Diabetes than those who ate less than one serving a month. In comparison, people who ate at least two servings of brown rice a week had an 11% lower risk of Type 2 diabetes than those who ate less than one serving a month. Brown rice may protect against diabetes because it has more fiber, vitamins, and magnesium and other minerals than white rice and because it raise blood sugar less than white rice does. 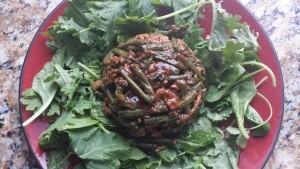 Here is one of my favorite recipes that spotlights green beans. You can use ground pork or ground turkey. For the leanest meat, use ground turkey breast. 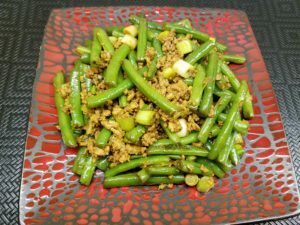 The dish will honestly taste the best if you use ground pork, but if you are trying to significantly cut calories and/or fat, use ground turkey breast. It will still be delicious. Cook’s note: You can turn this into a vegetarian dish by substituting tofu for the pork or turkey. You can use this as a completely meatless meal or a side dish. The sauce is delicious. Use the recipe for the sauce in other stir fries. Cut green beans into 2 inch pieces. Cook beans in boiling water 5 minutes or until crisp-tender. Time to cook will vary depending on diameter of the beans you are using. Drain. While the beans are cooking, make the sauce. In a small bowl, stir together sugar, cornstarch, ground pepper, red pepper flakes, dry mustard, sherry, soy sauce and water until sugar dissolves; set aside. Chop garlic and grate ginger. Add to sauce and stir. Wash the scallions, cut about 3 inches of the green off the ends and discard ends, and slice the scallions and put in a small bowl. Heat 1 tsp olive oil in 14-inch nonstick skillet over medium heat. Add pork or turkey. Cook, breaking pork into small pieces, until no pink remains, about 3-4 minutes. Don’t allow to overcook. Transfer to a large bowl. Stir sauce to recombine ingredients and pour sauce into skillet, stirring constantly until the sauce begins to boil, return cooked pork or turkey and green beans to the skillet. Stir and cook until sauce is thickened and evenly distributed, about 1-2 minutes. Remove skillet from heat and stir in scallions. Serve immediately.